DETROIT -- Fifteen automotive suppliers from North America, Europe and Japan won top honors for game-changing innovations during the annual Automotive News PACE Awards presentation on Monday. Federal-Mogul Corp. led the field with three winning entries, and Delphi Corp. had two. Other winners included Germany's Continental AG and ZF Getriebe GmbH. The winners were deemed by a panel of independent judges to be the best at creating innovative products and processes. In addition, Ford Motor Co. shared three Innovation Partnership Awards with supplier partners Clarion Corp. of America, Dura Automotive Systems Inc. and Meridian Lightweight Technologies Inc. Bombardier Recreational Products Inc. and Robert Bosch also received an Innovation Partnership Award. PACE stands for Premier Automotive Suppliers' Contribution to Excellence. 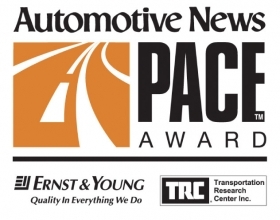 The awards, now in their 16th year, are sponsored by Ernst & Young, Transportation Research Center Inc. and Automotive News. From the judges' citation: "For the first time, adaptive cruise control, early collision warning and a host of related safety features will be affordable for all vehicle classes. Achieving multimode long- and short-range radar in a single box, Delphi's innovative design represents a significant breakthrough in cost/performance and manufacturability." From the judges' citation: "With a target buyer demographic [for pickups] as much urban as rural, a defrost feature on the rear sliding window has become a necessity. Dura's horizontal sliding rear window with defrost incorporates the defrost capability without compromising design or degrading styling aesthetics." From the judges' citation: "The magnesium tailgate inner is the largest die cast magnesium closure panel globally. It not only saves substantial weight but also functions as the primary structural load-carrying component of the liftgate assembly, meeting stringent crash performance requirements." From the judges' citation: PPG's "new paint chemistry for [electrocoat] systems achieves 'super-high throw,' allowing paint to penetrate recesses and coat interior surfaces without excess paint on exterior surfaces. … In one year, PPG and Toyota have launched super-high-throw electrocoat at 11 plants in North America and Europe." From the judges' citation: "With its innovative geometry of two sets of turbine blades in parallel on a single impeller, the dual-channel, single-stage pump achieves greatly increased dynamic operating range to accommodate a wide range of conventional and flex-fuel powertrains. Its 20 percent higher efficiency affords lower electrical demand and longer life." From the judges' citation: "WABCO's configure-to-order OptiDrive system improves vehicle control and safety while enhancing the driver's effectiveness. It also significantly contributes to decreased fuel consumption and reduced maintenance cost for the vehicle's powertrain. OptiDrive's modularity and reliance on advanced electronics enables a rapid low-cost development cycle that allows WABCO to go into markets and product segments that previously could not support automatic manual transmissions' upfront investment costs." Regensburg, Germany, and Auburn Hills, Mich.
From the judges' citation: "The Smart NOx Sensor is the first on-board sensor capable of direct measurement of [nitrogen oxide] in parts-per-million levels. Using the Smart NOx Sensor, vehicle and engine makers can meet EPA 2010 and Euro V emissions requirements while providing customers better fuel economy and eliminating the unpleasant ammonia odors associated with competitive urea-based exhaust treatment strategies." From the judges' citation: "This direct-injection piezo innovation represents a significant step in diesel direct-injection possibilities, offering unique capabilities that reduce particulates or NOx by 30 percent, a game changer that is required for the new generation of low-NOx diesel-engine processes. This key innovation increases power by 8 percent and decreases fuel consumption by 4 percent even as it avoids or minimizes the use of complex and expensive de-NOx after-treatment systems." Aubange, Belgium, and Southfield, Mich.
From the judges' citation: "The Bayonet Connection System not only improves both the security of connection and ease of removal, it also improves the grip and rotational angle compared to other existing connector systems." From the judges' citation: "Designed to work with both conventional gas and diesel engines that are available today, ZF's new transmission is also easily adaptable to the new hybrid powertrains of tomorrow. This new innovative transmission represents another significant milestone in fuel consumption, performance and package flexibility over existing technology available today." From the judges' citation: "This process uses less paint, less energy, less floor space and gives better corrosion resistance than comparable wet-on-wet processes using an e-coat base, and with 70 to 80 percent lower capital cost. … Auto-deposition with co-cure is believed to be a superior platform from which to achieve the goal of the industry: a three-coat application with one curing oven for all three." From the judges' citation: "One of the key benefits of the EcoDryScrubber is that because of its extremely efficient filtration capability, up to 95 percent of paint booth process air is recirculated. By re-circulating air, energy consumption in the paint spray booth is reduced by 60 percent and in the entire paint shop by 30 percent. The paint spray absorptive agent is inexpensive, powdered limestone, which is recycled after use as a commodity in other industries such as cement making." From the judges' citation: The "DuraBowl process remelts the highly stressed combustion bowl area to create a aluminum piston with over six times the durability of conventional aluminum pistons. A second dimension of the DuraBowl innovation is the proprietary inline Eddy control testing process that validates the microstructure and integrity of the DuraBowl process in every piston prior to delivery." From the judges' citation: "Federal-Mogul developed an extension of electro-chemical machining that for the first time makes this approach feasible for high-volume automotive production -- and at lower production cost, which helps open the design envelope for diesel engines. … The process is applicable to other ultrahigh-tolerance machining." From the judges' citation: This "process provides automakers the superior durability, perceived quality and reduced environmental impact of higher-cost filmed coatings at a price equal to or lower than painted plastics. …The close collaboration between Johnson Controls and Nordenia resulted in a new automated manufacturing process that integrates thin-film technology, deep drawing, back injection molding, laser cutting and the edge-wrapping processes." From the judges' citation: "The current number of lines of code is about 10 million in a typical vehicle. By 2015, 100 million lines of code will be within connected vehicles. Siemens and Ford have created a software management system permitting them to monitor every vehicle variation on a global basis down to the vehicle identification number. This innovation extends the lifetime control Ford has of its global fleet by leveraging existing software management processes that also maintain security protocols for firewalls between competing suppliers." From the judges' citation: "Bosch had to learn to work with a small, fast-paced development organization that had no prior experience with stability and traction control systems while dealing with the dynamics of a lightweight three-wheel design. BRP in turn had to learn about the interrelatedness of systems and to convey the 'sporty' experience users expected of its products. Bosch and BRP collaborated closely throughout the project to develop a system that was tuned to handle aggressive riding, yet provide the margin of safety that would make the Spyder appeal to its target purchasers." From the judges' citation: "Clarion and Ford reworked the rules of collaboration, in that they successfully operated together dealing with other global software and electronics companies such as Microsoft and Sirius. The working relationships established by the joint development teams provide a model for future technologies and in-vehicle software efforts." From the judges' citation: "Dura collaborated in the design development and implementation with Ford as well as with the other external suppliers of glass and switches." From the judges' citation: Meridian and Ford "have collaborated over the past 10 years to develop and produce what is the largest magnesium structural casting ever for the automotive industry, resulting in weight savings in excess of 20 pounds per vehicle. … Numerous design, manufacturing and testing innovations were required by the Meridian and Ford engineering teams to produce this part. During the process, Ford made their computing power available to Meridian for simulation runs."